Rainbow trout is a fish like salmon that inhabits both freshwater and the open sea. 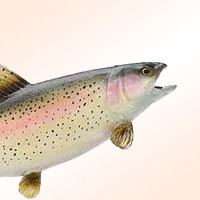 However, rainbow trout is commonly used to refer to rainbow trout cultured in freshwater versus rainbow trout cultured in sea that is said to be higher in calories. Freshwater rainbow trout can be found in placed like Alaska in the Kobuk River where it can be found swimming alongside larger king salmon. The calories in Rainbow Trout per 110g(1fish small edible part) is 140 calories. Rainbow Trout is calculated to be 127Cal per 100 grams making 80Cal equivalent to 62.99g with 21.67g of mostly protein、5.06g of fat、0.11g of carbohydrates in 110g while being rich in vitamins and minerals such as Vitamin B12 and Vitamin D.